Wolverine vs. Predator isn’t strictly a fan film but was made for the Super Power Beat Down web series which pits movie/comic characters against each other. The short was originally released on August 7, 2013. 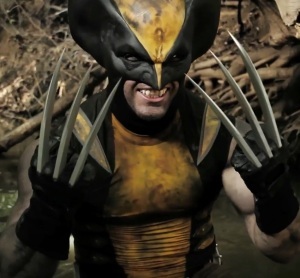 Wolverine vs Predator is another fan-made film but was made for Machinima’s web series Super Power Beat Down that sees them film battles with famous movie characters. They’ve done Batman vs Darth Vader and Superman vs Thor to name a few. Production values tend to be quite high and they all seem to have cracking special and visual effects. Wolverine vs Predator was shot in California over five days and is about five minutes long. It was first released in August 2013 but I only watched it for the first time a few weeks ago. The battle takes place in the jungles of Columbia, South America where Wolverine is lurking through the wilderness while a Predator stalks him from the trees. A brutal battle ensues between them. The episodes in this web series aren’t about story – they’re about seeing our favourite characters fighting to the death. Wolverine is played by Jonathan Carroll while the Predator is played by 6’7” Jamie Hall who also happens to be Kevin Peter Hall’s nephew. We all know he played the Predator in the original Predator movies. I will say right now, that I probably like X-Men more than Predator. I like Wolverine and Hugh Jackman but I’m not too crazy about this version of Wolverine. I’ll give them credit for having Wolverine in his yellow costume like the comics but there’s a reason it was never used in the X-Men movies. It just doesn’t like that great in a live-action piece. I also didn’t like the strange fangs they have on Wolverine here. The Predator on the other hand is absolutely outstanding. The Predator costume is possibly the best I’ve seen in a fan film. It’s *exactly* like the original 1987 Predator down to the last detail. The Predator has his trademark weapons and equipment such as wristblades, shoulder cannon, dagger and cloaking device. You can even see the lights flashing on his wrist gauntlet. Midway through the film, the Predator removes his mask showing his face complete with moving mandibles. Yes, it’s nowhere near as good as the Predator movies (though it’s better than the piece of crap we saw in Alien vs Predator) but it is the best I’ve seen in a fan film. The best part of the fan film is the visual and practical effects. We first see the Predator cloaked and he later uses his targeting laser, fires off multiple shoulder cannon blasts which are more similar to what we saw in AvP. Still looks phenomenal for a fan film though. The Predator has his thermal vision mode which is slightly different here. It’s sort of a mixture between 1987’s Predator and 2004’s AvP in a blue/orange colour. I usually whine whenever filmmakers don’t use the original blue thermal vision but this actually looks pretty good. Wolverine has his retractable adamantium claws which I think must be a mixture of CGI and practical effects. The battle itself is absolutely brutal. Wolverine is hit multiple times with the shoulder cannon while the Predator is stabbed in the stomach and legs countless times with green florescent blood pouring out of him. Wolverine fares no better and is stabbed in the stomach with the Predator’s wristblades. The final moments of the battle see the Predator stabbing Wolverine in the neck and blood is pouring out of his mouth while Wolverine impales his claws into the Predator’s skull. The Predator’s self-destruct device is activated and Wolverine runs for cover as a huge explosion follows. Wolverine is the clear victor of the battle thanks to his regenerative abilities. Overall, in terms of practical and visual effects, this might be the best Predator fan film I’ve seen. It edges out the recent Predator: Dark Ages fan film but at the same time it’s like comparing apples and oranges. Wolverine vs Predator is not really a fan film and there’s not really any kind of story. It’s just an excuse to see Wolverine and a Predator killing each other but it delivers on that promise.